Once established, second-growth forests dominated by alien plants may provide suitable environmental conditions for the maintenance of populations of some rare native species, and thus should not be neglected in conservation studies. 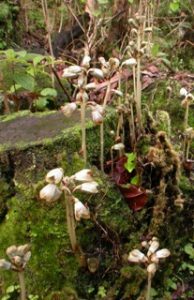 We illustrate the case of Gastrodia similis Bosser, a small terrestrial orchid endemic to the lowland rainforest of Reunion island. Despite some very specific ecological requirements (necessary mycorrhizal symbiosis with wood-decay fungi and pollination by specialized drosophilid flies), the populations of this rare species are spreading beneath some secondary forests growing at low altitude, extending northward the species geographical distribution. Other native species might also restore populations in this place. We call for more biodiversity assessments and experimental trials in these hybrid ecosystems.